NEW YORK, NY -- A job at the investment bank Goldman Sachs is one of the most prized positions in the country. The company prides itself on attracting some of America's most talented professionals—ambitious, smart and highly motivated. Many people would probably be very surprised to discover that at least one undocumented Mexican immigrant was working shoulder to shoulder with the country's corporate elite. Former Goldman Sachs vice president Julissa Arce, 32, wants to change the way Americans think about immigration by sharing her story. And in her upcoming September 2016 memoir, "My (Underground) American Dream," she aims to describe her long and difficult journey from undocumented to documented, which took her from selling funnel cakes in Texas to Wall Street. 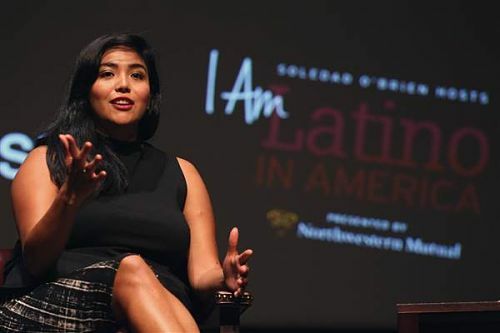 Immigration rights advocate Julissa Arce attends the Latino In America held at Occidental College on October 15, 2015 in Los Angeles, California. Tommaso Boddi / Getty Images The young Mexican immigrant used forged documents when she applied to Goldman Sachs, where she lived a double life during seven years. On the one hand, she was earning raises and promotions—starting with an internship in 2004, then hired full-time after graduation and climbing up the corporate ladder from an analyst in 2005 to vice president until leaving in 2011. On the other, she couldn't apply for a credit card, drive with a valid license, or travel outside the country because she was still undocumented. "I didn't think of it from day to day… but there were definitely some scary moments," Arce said in a phone interview with NBC News. "I was focused mostly on doing a good job," said Arce, who has always been a whiz at math and was working on complex financial instruments like structuring derivatives. "But if I ever got called into my boss's office unexpectedly, my first thought was always 'they found out'… and the effects of being confronted with that truth lasted for weeks." Arce's "double life" started when she was 11 years old. She came to the United States in the summer of 1994 with a tourist visa, and stayed without documentation after the visa expired three years later to avoid being separated from her parents. But in spite her legal status, Arce exceled as a student—first as a member of the National Honor Society in high school, and then in college, where she majored in finance. She attended college through the Texas Dream Act which allowed qualified undocumented students to pay in-state tuition, and she graduated with honors from the University of Texas at Austin. "I wouldn't have a story to tell if I hadn't gone to college," said Arce. "Education was my salvation." But after years of living with fear and shame, the Wall Street executive was inspired to tell her story after seeing the 2013 movie "Documented," which chronicles how Pulitzer-winning journalist Jose Antonio Vargas came out as an undocumented immigrant in a New York Times Magazine essay. And now, Arce urges other undocumented immigrants to overcome social and political stigmas by sharing their stories. "As long as people see immigration in numbers and statistics, it will be difficult to change the conversation," she said. "But when you combine personal stories with facts and data, you can help everyone understand." The power of telling her personal story has had an impact. "Wouldn't it be great if we could give a home to more of the talented young people who come to this country for an education and want to apply their energy and skills to supporting our economy?" said influential Goldman Sachs CEO Lloyd Blankfein to Bloomberg Business when asked about Arce's story. When Arce looks back on European immigrants in the 19th and 20th centuries—who arrived before modern-day quotas and visa requirements—she can't help but seeing herself in their stories and photos. Now, she wants Americans to reconnect with that early immigration history and listen to the stories of Latinos, Asians, Africans and other undocumented immigrants today who work hard to earn their piece of the American Dream. "If we wanted to just get by," said Arce about undocumented immigrants, "we would have stayed in the places we come from. But we cross deserts because we want a better life - we want to work hard - and we want to contribute to this country that we now call home."